Why do some traumatized people get PTSD while others don't? 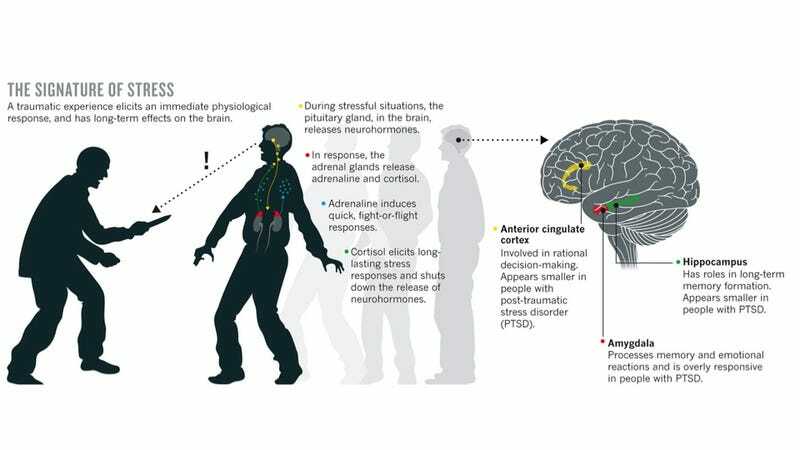 A fascinating new article by Virginia Hughes in Nature explores the most recent discoveries that neuroscientists have made about the mechanisms that cause post-traumatic stress disorder, or PTSD. The story focuses in part on the story of one woman, a psychotherapist who was raped and then thrown off a bridge, and how she's recovered from PTSD in decades since. Her tale provides the backdrop for what we now know about how our brains are reshaped during traumatic events. Over the past two decades, researchers have used various kinds of imaging techniques to peer inside the brains of trauma victims. These studies report that in people with PTSD, two areas of the brain that are sensitive to stress shrink: the hippocampus, a deep region in the limbic system important for memory, and the anterior cingulate cortex (ACC), a part of the prefrontal cortex that is involved in reasoning and decision-making. Functional magnetic resonance imaging (fMRI), which tracks blood flow in the brain, has revealed that when people who have PTSD are reminded of the trauma, they tend to have an underactive prefrontal cortex and an overactive amygdala, another limbic brain region, which processes fear and emotion. People who experience trauma but do not develop PTSD, on the other hand, show more activity in the prefrontal cortex. Essentially, it seems that some people's brains are anatomically better able to recover from trauma than others. This could help doctors tailor therapies better, and might even help researchers develop drugs that would ease the symptoms of PTSD. You'll definitely want to read the whole article over at Nature.